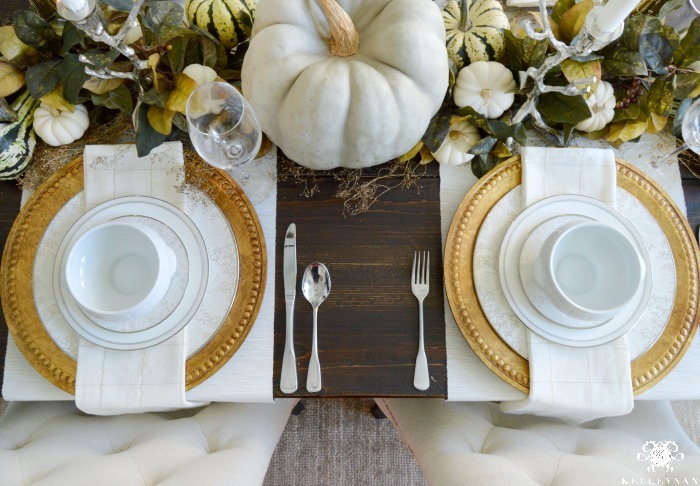 I teased my first fall table a little bit in my Fall Home Tour (HERE), but today gave me the perfect opportunity to share since I have joined a few other bloggers to share all things “fall” in a loop for Autumn’s in the Air. If you are joining from lover of all things glam, Summer at She Leaves a Little Sparkle, welcome! 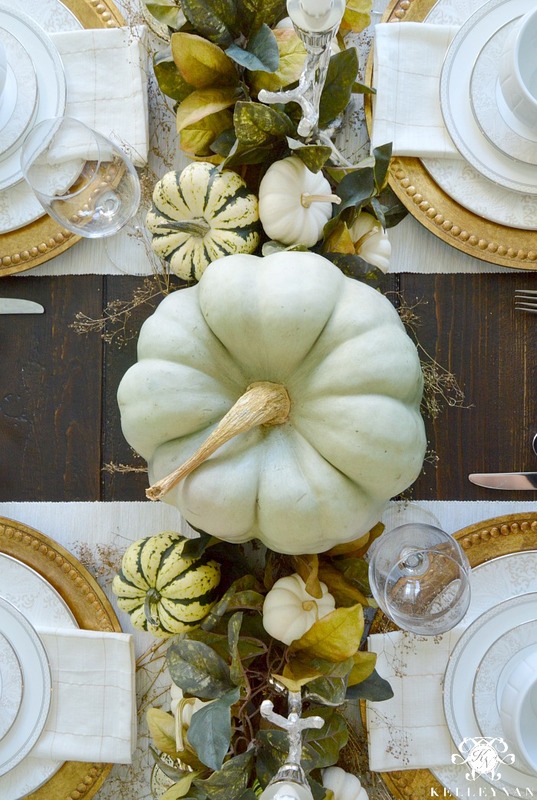 I wanted to create something different than the tables I shared last year (HERE and HERE), so I used some of my own advice in yesterday’s tips and focused on those perishable pumpkins that I wouldn’t have to spend a lot of money on/store after the season. The result is one of my favorite tables yet. 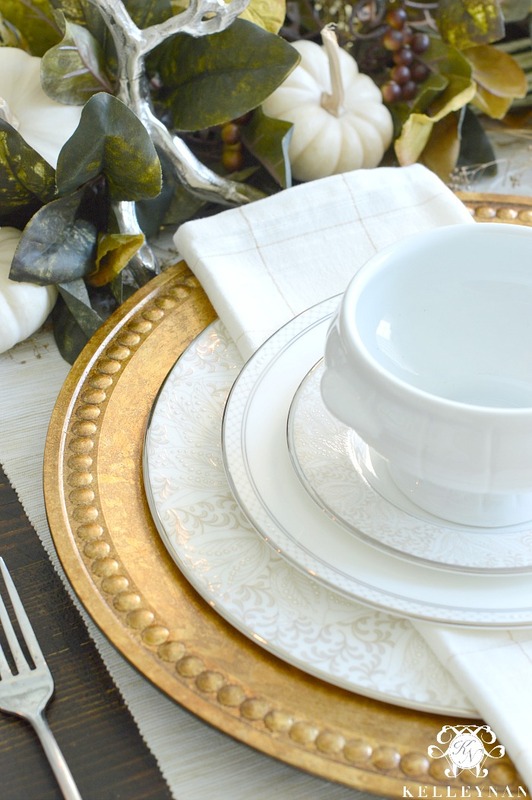 *You can check out all of my tablescapes HERE. I love using a garland of sorts as a table runner. However, I knew what I wanted and was striking out in the fall decor section of Hobby Lobby and Michaels. Before leaving the last store in defeat, I made one last ditch effort and went to the aisle that held regular, non-seasonal garland. They had a ficus leaf variety that I thought more closely resembled magnolia leaves with some of the faded browns and dark greens. It was perfect. I had picked up a green pumpkin for the centerpiece, the baby boos, and the green and white squash from a local pumpkin farm. 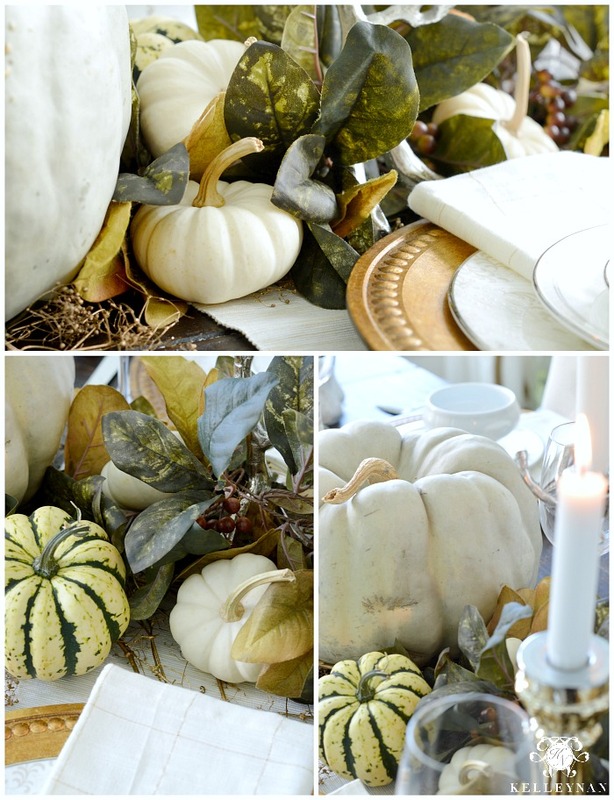 They were able to be nestled into the greenery so perfectly, as though I had my own mini pumpkin patch running down the table. If you caught my Instagram story, you saw me in action, first laying down the golden, twiggy spray I also picked up from Michaels. I recently talked about the beauty in changing a table setting by simply changing your napkin (HERE), so you probably know, I have a lot. More than a lot… haha But, I couldn’t resist these sweet, neutral napkins, woven with golden thread (HERE). From this view, you can peek past my entry into my formal sitting room, all decked out for the season. If you missed it, I’ve included all the details from this room and my entire home in my fall home tour (HERE). If you missed the excitement over my new Asher bar cart, you can that out HERE. That soup I mentioned earlier? I just made a fresh batch 😉 My husband requests this more than any other meal I cook. *Note: I do not remember where this recipe originated but I have tweaked it over the last few years. On the first night, I make the chicken mixture and serve chicken tacos/taco salads, etc. The following night, I use the remaining chicken mixture for the chicken tortilla soup. This recipe will feed your family for MANY meals; have containers for the freezer ready. As always, you can cut the recipe in half or adjust as needed. Regardless, I still stick to the same ingredient amounts for the chicken mixture. Place chicken in the bottom of the crock pot; it can be frozen. Dump the rest of the ingredients on top and cook on low for 6 to 8 hours. Shred chicken once tender and serve. *You can add Mexican rice if you have any on hand. I usually dump whatever we have left from the night before in the pot. Add all ingredients to a large pot and simmer for 1 hour. The longer the soup simmers, the more flavorful it will be. When serving, you can add cheese, tortilla chips, green onions, a dollop of sour cream, etc. Stunning! 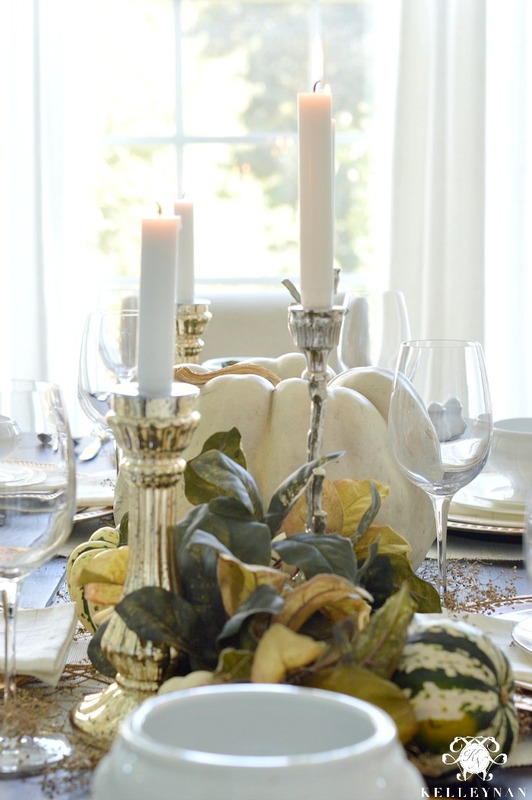 You have a gift for creating such gorgeous tablescapes! 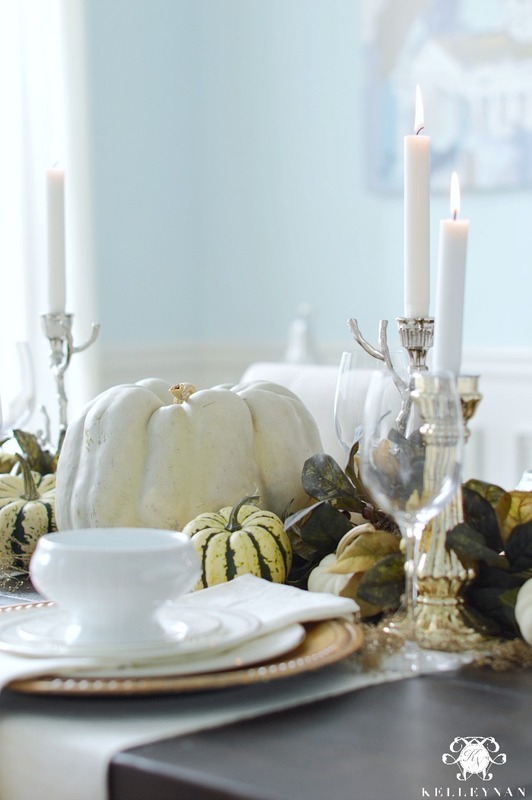 I love the garland you chose … it’s the perfect backdrop for your fabulous “mini pumpkin patch!” Your chargers and plates add such elegance, and I’d love to enjoy a bowl of your yummy soup! Glad to be part of the Fall blog hop with you and look forward to seeing more of your seasonal home! 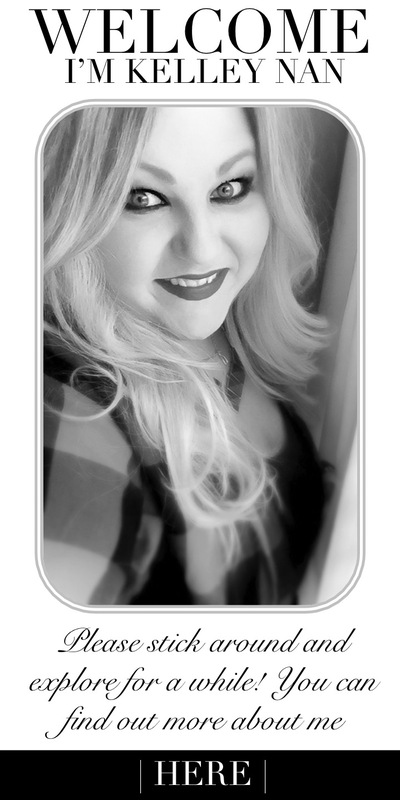 Gosh girl….you are amazing! You always blow me away with your styling! LOVE THIS and now I need some soup! Courtney! You are so sweet to say that! YOU are so good and I wish I could be half as crafty as you! Can’t wait to check out your post today! Oh Kelley! I just love your mini pumpkin patch Ha! I am with you… Such a great idea for a table runner. 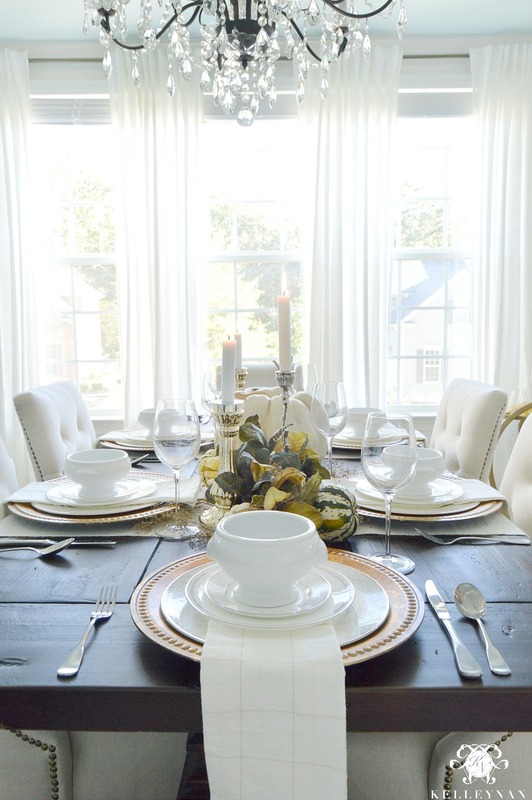 I absolutely love the way you add elegance to your table and love every detail. 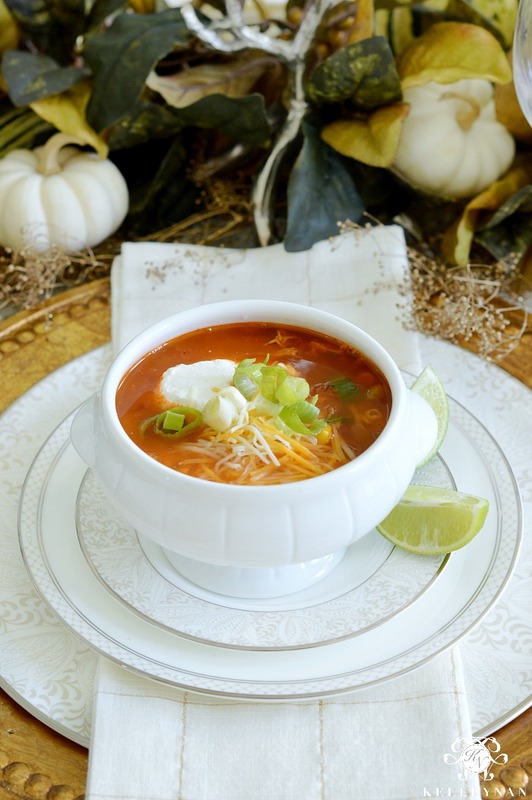 Those little soup bowls are precious… I’ve got to find some of those one of these days! And that soup is one of my favorites as well. Combining my two favorite loves…soup and Mexican food 😜💕. This is so gorgeous, as usual my friend! Summer, thank you! And yes, that soup is bomb.com haha. Can’t wait to check you out today- my peek had me swooning over all that romance! Goodness, it’s all so pretty! You nailed it. Love everything! Sarah, thank you so much! Excited to dive into yours today! Beautiful as always! 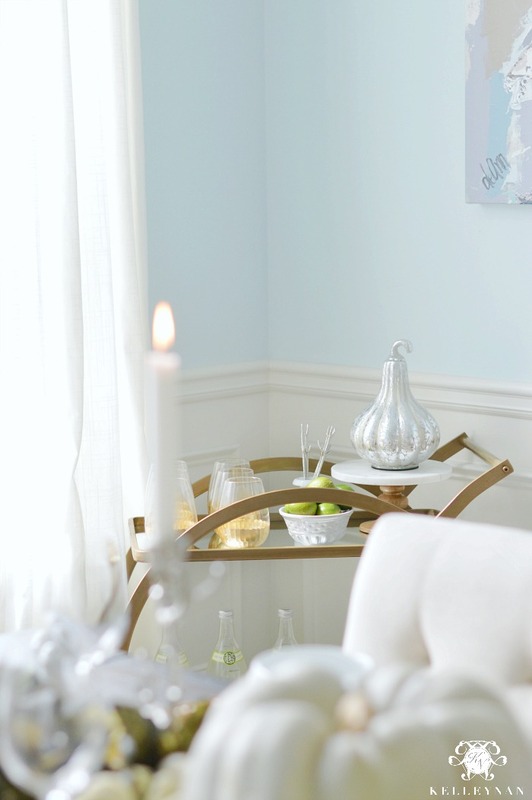 I see the candlestick holders you tagged from pottery barn, but would you mind sharing where the silver candlestick holders are from? The ones that almost look like tree branches. Thank you! If I remember correctly, HomeGoods last year. If you Google for some similar ones, search for “stag”, “antler”, and “branch” candle holders! So pretty! I will have to try that chicken tortilla soup recipe. Thanks for sharing. Kelley! 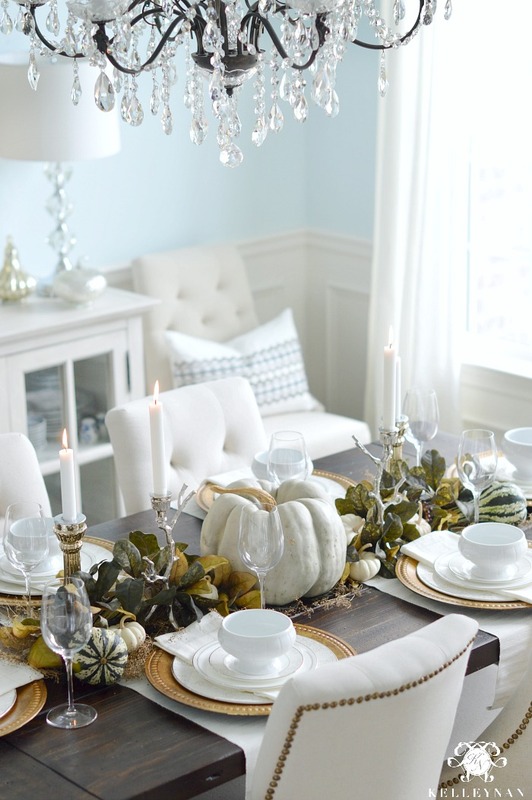 Your tablescapes get me EVERY TIME! This is STUNNING, girl! 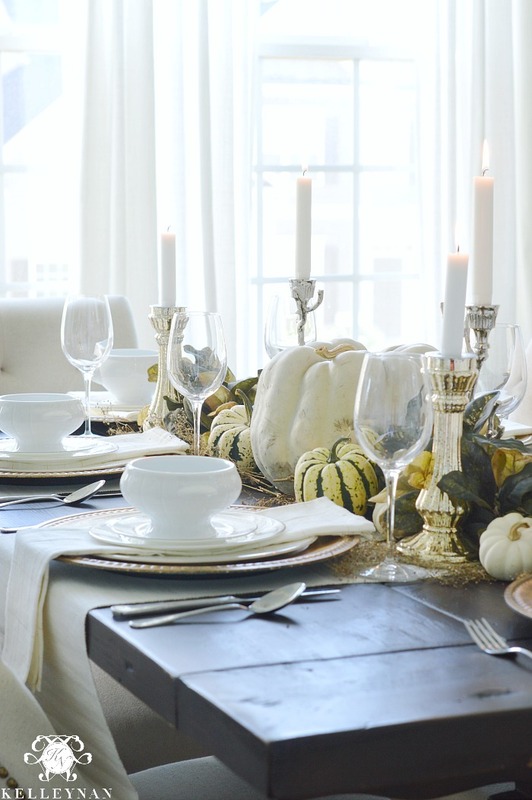 You are seriously the queen of elegant tablescapes. That soup looks amazing too! I’m going to have to try it out! Gorgeous tour, sweet friend! Jennifer, thank you, my fellow neutral lover! You home is fall-perfect and I am so jealous of that plaid in your living room! Can I just say WOW! Every detail is just on point Kelley!! You have a serious gift! 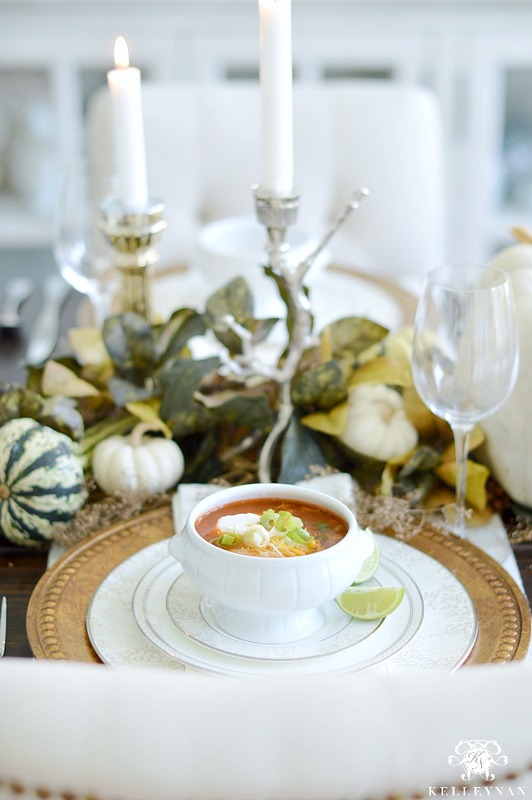 Really love your styling and how you incorporated a recipe with a tablescape! Brilliant! So glad to have done this amazing blog hop with you! You are a true talent! Lacey, I so enjoyed this! Thank you so much; I am still loving your mauve furs! Kelley! You never disappoint with your fabulous table scapes but you may have just outdone yourself this time!! 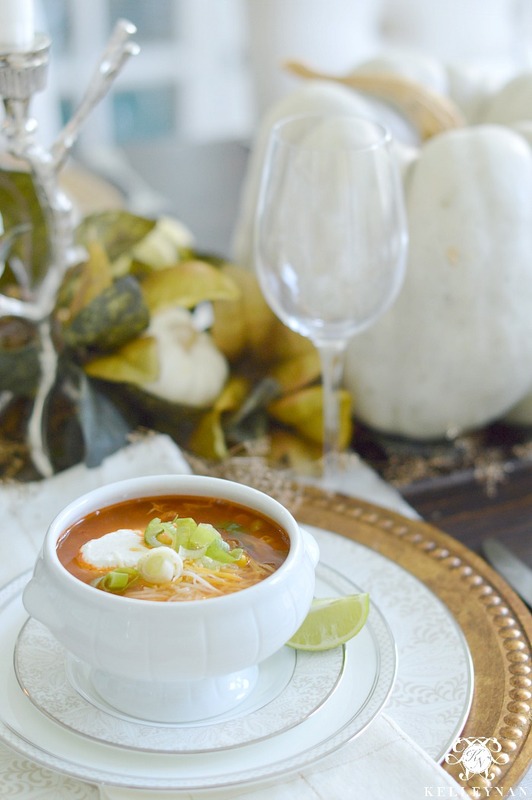 Can’t get over those pumpkin soup bowls and I love that you got them in our LA;). Absolutely gorgeous tour sweet friend!! This is so beautiful Kelley! I love all of your decorating. You nail it every time! I may have to copycat this! Love it Kelley! What a wonderful tablescape. I must say, that pumpkin in the middle may be the greatest white pumpkin ever!!! Love you friend! Jen, thank you so much! Love you back!! Kelley! 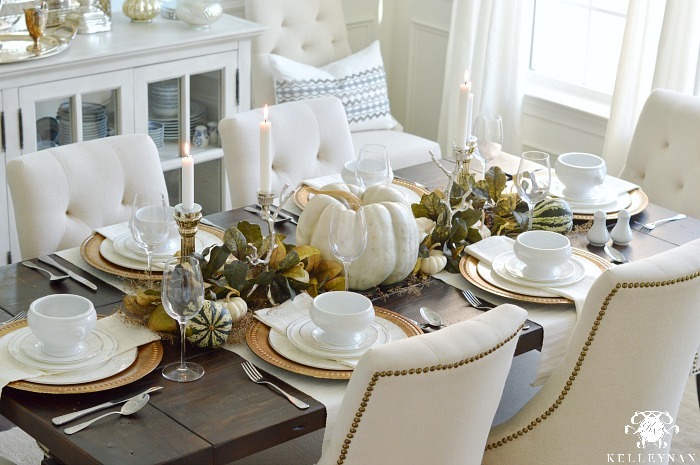 I always love your table settings and this one is just so gorgeous! 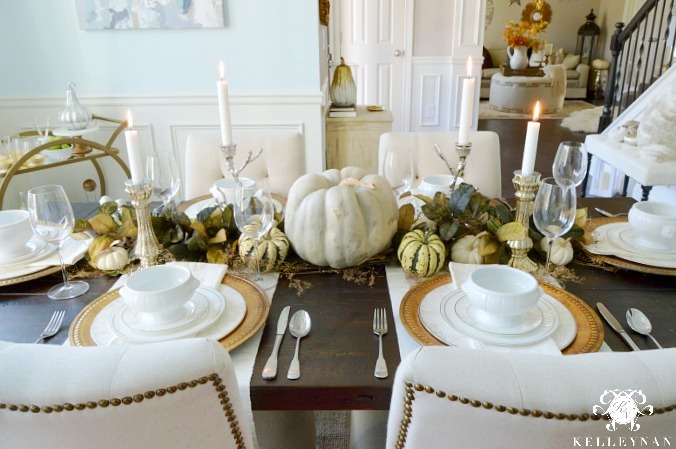 I love how you used real pumpkins mixed with faux foliage and how you made it look classic and elegant! 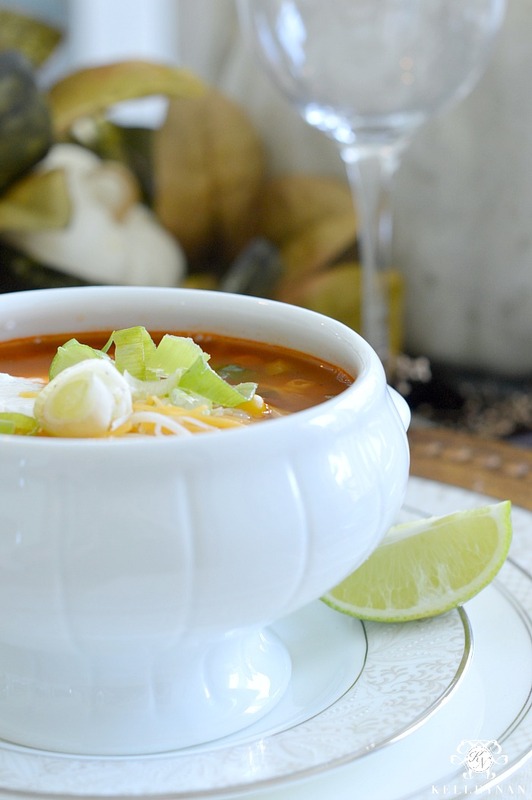 I too am a soup lover and I will have to try this recipe it looks so delicious! (everyone around here is vegetarian so I will need to adjust for that but should be easy to do) Thank you so much for being a part of this tour, it is such a pleasure to team up with you and hope we can do it again! Kim, thank you so much for hosting; I loved this hop! I am still swooning over your ridiculous arrangements and mantel!! And I will have to try your recipe! I ,too, love to cook and soup is on regular rotation here in the fall and winter months! Thanks so much for being a part of our tour! So, so glad that you could do it and hope to team up again in the future! Kelly your table is exquisite . You take setting a table to new levels. I can’t even express how pretty it is and how enchanting your photography is as well!! love this table! the gold twiggy stuff is such a nice touch. Lauren, thank you so much! It was one of those things that was like “I don’t have enough eucalyptus but hay/straw may be too rustic. This gold twiggy stuff may do the trick” haha! Oh my goodness Kelley! This is magazine worthy! That soups sounds divine! I love it all! The food, the decor, the staging, the photography! All of it! Absolutely beautiful Kelley! 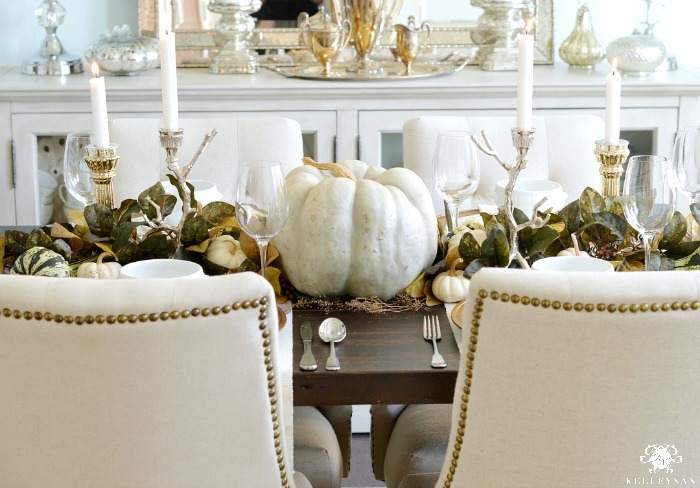 I love the neutral palette but with the hints of color from the pumpkins! Beautiful table. Pinning!! I am trying to make your soup. It sounds delicious!! I do have a slight problem, i dont know what rotel is? Maybe we call it something different here?? If you could help I would be so happy! Hahaha!! I just googled it! Hi, Dawn! It is diced tomatoes and green chiles. I use it for everything!! haha- Good luck and let me know how it turns out!! I always love looking through your beautiful photos Kelley!! And I am definitely going to add that soup to my meal plan for next week!!! Just put the chicken in the crockpot and have the soup part simmering. My house smells so good! Thanks for sharing. Perfect for this cold, dreary day!